Cancun and other representative spots of the Mexican Caribbean have become very popular among travelers during holiday season. It’s amazing how lights paint every road and place this time of the year, and the offer of activities, gastronomy and traditions is very special. Posadas are traditions in some places like Guatemala and Honduras. In Mexico, we celebrate them during the Christmas season, from the 16th to the 24th of December. Today, these are a reason to have a party, enlivened with punch and typical seasonal dishes and during which piñatas are broken. Swimming with dolphins… Florida or Cancun? 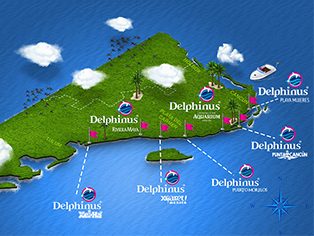 Many tourists yearning to have the best experience by swimming with dolphins among other activities, find themselves comparing both spots because they offer natural beauty, incredible beaches and entertainment for everyone. However, for you to make the best choice, here are the main differences between the two places. Cancun is –almost literally- a sea of options that allows you to never stop having fun and also learning. However, there is no ‘I’ve been to Cancun’ until you’ve actually been to Cancun. How? By doing these five basic but essential activities. We know you’ll be back anyway, but have in mind that you’ll have to return for each activity marked as undone.